Recent progress in biotechnology and genomics has expanded the plant breeders' horizon providing a molecular platform on the traditional plant breeding, which is now known as `plant molecular breeding'. Although diverse technologies for molecular breeding have been developed and applied individually for plant genetic improvement, common use in routine breeding programs seems to be limited probably due to the complexity and incomplete understanding of the technologies. This book is intended to provide a guide for researchers or graduate students involved in plant molecular breeding by describing principles and application of recently developed technologies with actual case studies for practical use. The nine topics covered in this book include the basics on genetic analysis of agronomic traits, methods of detecting QTLs, the application of molecular markers, genomics-assisted breeding including epigenomic issues, and genome-wide association studies. Identification methods of mutagenized plants, actual case studies for the isolation and functional studies of genes, the basics of gene transfer in major crops and the procedures for commercialization of GM crops are also described. 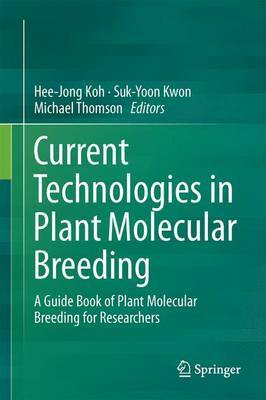 This book would be a valuable reference for plant molecular breeders and a cornerstone for the development of new technologies in plant molecular breeding for the future.